On top of the amazing atmosphere, free breakfast and nightly events this hostel made me feel at home while so far away! The staff was absolutely amazing and helped me to navigate Sydney! The room was large with large lockers. Bed was super comfy and staff was excellent. Location amazing walking distance to everything we needed. Worth the money if you don't plan on spending much time inside the hotel. Staff especially lady at the front desk were awesome and very friendly. Free amazing hot breakfast. Great to meet people! Perfect for the price. Well located! Location was close to the CBD, couldnt be better. Many restaurents and shops around. comfortable..nice beds and pillows for a good sleep. Was there just for a night and couldnt use much facilities..wifi was really good. charging points near each bed was awesome. Breakfast was impressive! The rooms were really great and they came in and cleaned the floor and bathroom every day. Breakfast was amazing! Staff were really nice and helpful. Wasn’t really any opportunity to meet people except for the people you were sharing a room with. Nice breakfast and great location. 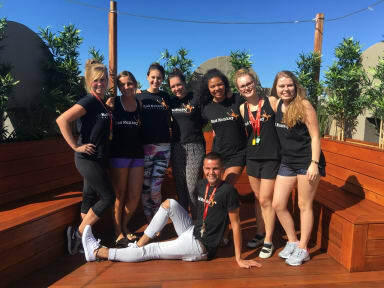 Facilities such as large lockers, fun events, a good common room, and free access to a gym around the corner made this hostel social and really worth the price. The staff members at the reception were so sweet and extremely helpful. Ended up extending for 3 extra nights. My only issue was with cleaners who walk over the clean beds sheets with their dirty shoes still on while changing the sheets and covers, please just take the shoes off. Net hostel. Goede bedden. Vriendelijke personeel. Locatie is ook goed. Dichtbij kings cross station en 40 min lopen van Sydney opera house. Keuken kan beter. I first enjoyed my stay, but the atmosphere changed so much that I decided to move to a different hostel. Normally they have a rule that you are not allowed to stay longer than 28 days. Sadly that does not appeal to everyone. If you are good with the staff you can stay longer otherwise you get kicked out. Besides the poor treatment by the management (always on their phone, ignore your greetings etc.) the hostel is good. Very clean and at the moment they doing a lot of renovation. The neighbourhood is close to the metro/train, but not very safe or nice. The kitchen was small, the equipment was old (most pans didn't have handles), there was not enough room for everyone to store their food and the dining area was tiny and if full there is no other place to sit. The rooms were cleaned everyday, but not very thoroughly. Our ensuite bathroom was old and smelled muffy. The cleaning staff almost forced me out of the bathroom in the morning while I was still getting dressed.